Church father and author; born about 340 at Treves; died 397 in Milan. This audacious prelate—who as bishop of Milan dared to say of his emperor, "The Emperor is in the Church, but not over the Church"—is more renowned perhaps for his energy and zeal than for his learning. His attitude toward Jews and Judaism was uncompromisingly hostile. An address of his to Christian young people warns them against intermarriage with Jews ("De Abrahamo," ix. 84, xiv. 451). But his opposition assumed a more positive and active character in the matter of the bishop of Callinicum in Mesopotamia. It appears that in 388 a mob, led by the local bishop and many monks, destroyed the synagogue at Callinicum. The emperor Theodosius the Great, who can scarcely be accused of lack of religious zeal, was nevertheless just enough to order the reerection of the synagogue at the expense of the rioters, including the bishop. Ambrose immediately issued a fiery protest to the emperor. He writes to Theodosius ("Epistolæ," xl. xvi. 1101 et seq.) that "the glory of God" is concerned in this matter, and that therefore he can not be silent. Shall the bishop be compelled to reerect a synagogue? Can he religiously do this thing? If he obey the emperor, he will become a traitor to his faith; if he disobey him, a martyr. What real wrong is there, after all, in destroying a synagogue, a "home of perfidy, a home of impiety," in which Christ is daily blasphemed? Indeed, he (Ambrose) must consider himself no less guilty than this poor bishop; at least to the extent that he made no concealment of his wish that all synagogues should be destroyed, that no such places of blasphemy be further allowed to exist. He also states, in extenuation, that in the time of Julian, the Jews destroyed the Christian basilicas in Gaza, Ascalon, Alexandria, and elsewhere. It is hard to say just what foundation there is for this charge againstthe Jews, seeing that all the misfortunes which befell the Christians in Julian the Apostate's reign were laid upon their shoulders. Continuing in this strain Ambrose implored the emperor to recall his edict. The emperor made no reply to this appeal; but his silence, instead of disconcerting the energetic churchman, simply induced him to take advantage of the opportunity which a visit by Theodosius to Milan in the winter of 388-89 offered, to speak upon the matter from the pulpit in the emperor's presence ("Epist." xl., xvi. 1113). He was, however, shrewd enough to appeal to imperial magnanimity, and with the most favorable result; for after the service Theodosius greeted the bishop with the words, "Thou hast preached against me!" "Not against thee, but in thy behalf!" was the prelate's ready reply; and, taking advantage of the emperor's passing humor, he succeeded in obtaining his promise that the sentence should be completely revoked. In this manner, this altogether discreditable affair ended in the victory of the Church, with the very natural consequence that thereafter the prospect of immunity thus afforded occasioned spoliations of synagogues all over the empire. That Ambrose could nevertheless occasionally say a good word for the Jews is shown by a passage in his "Enarratio in Psalmos" (i. 41, xiv. 943), in which he remarks, "Some Jews exhibit purity of life and much diligence and love of study." That in his literary activity Ambrose drew extensively upon Philo is well known; the fact even gained for him the name of "Philo Christianus," the Christian Philo (Aucher, introduction to Philo, "Quæstiones et Solutiones"). He was the channel through which many types and personifications originating with the Alexandrian Jewish philosophy were embodied in both the art and the literature of the Middle Ages down to Dante. So closely does he follow Philo that many corrupt passages of the latter's text may be emended through Ambrose's quotation of them, and many misreadings may in this way be corrected (compare Förster, "Ambrosius, Bischof von Mailand," p. 180, and the Vienna edition of Ambrose, xxii. pt. i. 360). Examples of Ambrose's indebtedness to Philo are to be found in his interpretation of the four rivers of Paradise (compare Ambrose, "De Paradiso," iii. 14, xiv. 280, with Philo, "Leg. Allegr." xix.) as the four cardinal virtues, wisdom, temperance, courage, and justice. The law concerning the children of the two wives (Deut. xxi. 15) is explained by Ambrose ("De Abel et Cain," i. 4, xiv. 322) almost exactly in the words of Philo ("De Sacrificiis Abelis et Caini," v.). Philo interprets Adam as signifying "reason"; Eve, "emotion." Ambrose has it: "Adam mentem diximus; Evam sensum esse significavimus" ("De Abrahamo," ii. 1. xiv. 455). For a complete collection of allegorical interpretations drawn by Ambrose from Philo, see Siegfried "Philo von Alexandria," pp. 371-87. This collection will serve to show his indebtedness to Philo, not only in the matter of actual allegorical imagery borrowed from him and the adoption of his rules of interpretation, but also in the numerous echoes of the Philonic doctrines concerning God and man which therein abound. Besides Philo, the IV. Maccabees exerted great influence upon Ambrose, particularly in regard of his homiletic style, which in later days was regarded as unapproachably fine. Freudenthal shows how he quoted long extracts from this book in his sermons, frequently, indeed, word for word. 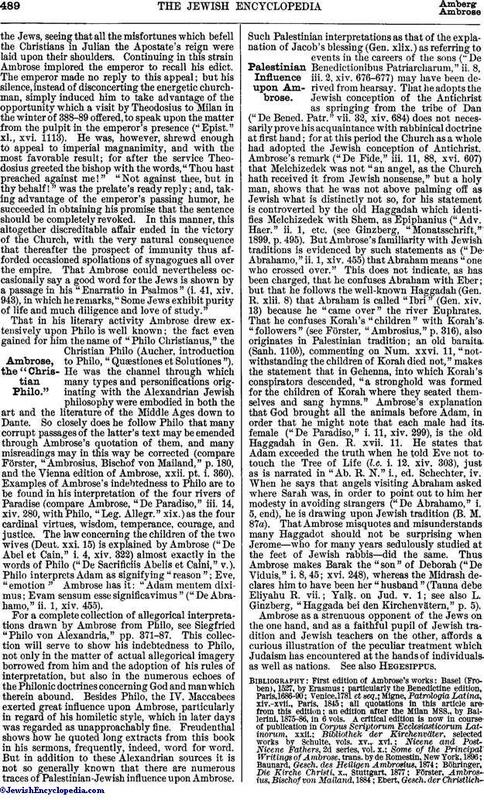 But in addition to these Alexandrian sources it is not so generally known that there are numerous traces of Palestinian-Jewish influence upon Ambrose. Such Palestinian interpretations as that of the explanation of Jacob's blessing (Gen. xlix.) as referring to events in the careers of the sons ("De Benedictionibus Patriarcharum," ii. 8, iii. 2, xiv. 676-677) may have been derived from hearsay. That he adopts the Jewish conception of the Antichrist as springing from the tribe of Dan ("De Bened. Patr." vii. 32, xiv. 684) does not necessarily prove his acquaintance with rabbinical doctrine at first hand; for at this period the Church as a whole had adopted the Jewish conception of Antichrist. Ambrose's remark ("De Fide," iii. 11, 88, xvi. 607) that Melchizedek was not "an angel, as the Church hath received it from Jewish nonsense," but a holy man, shows that he was not above palming off as Jewish what is distinctly not so, for his statement is controverted by the old Haggadah which identifies Melchizedek with Shem, as Epiphanius ("Adv. Haer." ii. 1, etc. (see Ginzberg, "Monatsschrift," 1899, p. 495). 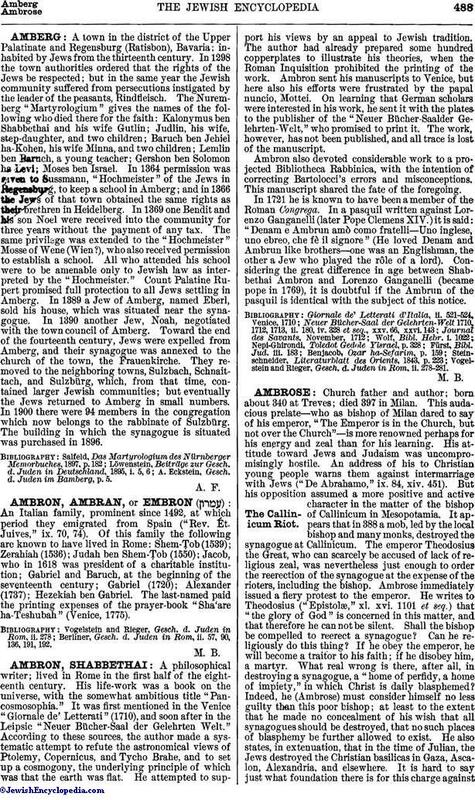 But Ambrose's familiarity with Jewish traditions is evidenced by such statements as ("De Abrahamo," ii. 1, xiv. 455) that Abraham means "one who crossed over." This does not indicate, as has been charged, that he confuses Abraham with Eber; but that he follows the well-known Haggadah (Gen. R. xlii. 8) that Abraham is called "Ibri" (Gen. xiv. 13) because he "came over" the river Euphrates. 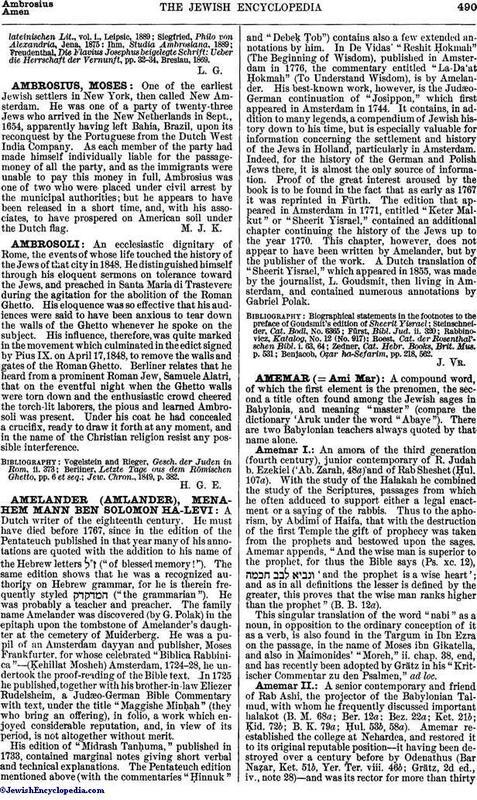 That he confuses Korah's "children" with Korah's "followers" (see Förster, "Ambrosius," p. 316), also originates in Palestinian tradition; an old baraita (Sanh. 110b), commenting on Num. xxvi. 11, "notwithstanding the children of Korah died not," makes the statement that in Gehenna, into which Korah's conspirators descended, "a stronghold was formed for the children of Korah where they seated themselves and sang hymns." Ambrose's explanation that God brought all the animals before Adam, in order that he might note that each male had its female ("De Paradiso," i. 11, xiv. 299), is the old Haggadah in Gen. R. xvii. 11. He states that Adam exceeded the truth when he told Eve not to touch the Tree of Life (l.c. i. 12, xiv. 303), just as is narrated in "Ab. R. N." i., ed. Schechter, iv. When he says that angels visiting Abraham asked where Sarah was, in order to point out to him her modesty in avoiding strangers ("De Abrahamo," i. 5, end), he is drawing upon Jewish tradition (B. M. 87a). That Ambrose misquotes and misunderstands many Haggadot should not be surprising when Jerome—who for many years sedulously studied at the feet of Jewish rabbis—did the same. Thus Ambrose makes Barak the "son" of Deborah ("De Viduis," i. 8, 45; xvi. 248), whereas the Midrash declares him to have been her "husband" (Tanna debe Eliyahu R. vii. ; Yalḳ. on Jud. v. 1; see also L. Ginzberg, "Haggada bei den Kirchenvätern," p. 5). Ambrose as a strenuous opponent of the Jews on the one hand, and as a faithful pupil of Jewish tradition and Jewish teachers on the other, affords a curious illustration of the peculiar treatment which Judaism has encountered at the hands of individuals as well as nations. See also Hegesippus. an edition after the Milan MSS., by Ballerini, 1875-86, in 6 vols. Freudenthal, Die Flavius Josephus beigelegte Schrift: Ueber die Herrschaft der Vernunft, pp. 32-34, Breslau, 1869.